Original on "Claybord" Masonite.The overall size of this piece is 12" x 18". Pencil on heavy-weight illustration board. Description: This is a "pencil" of "The Old Cheyenne." 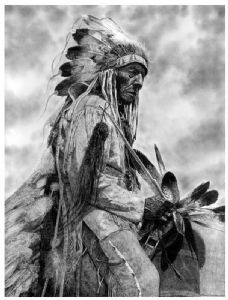 The reference photograph was taken in 1930 by Edward S.Curtis.